Bacteria is the kingdom that encompasses the largest number of species. Bacteria are unicellular living organisms without a nucleus (prokaryotes). In Flora of Quebec only bacteria visible to the naked eye (actually clusters of millions, even billions of individuals) are considered. 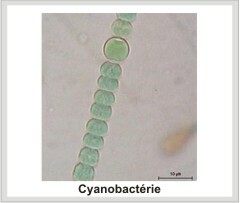 The bacteria most known and visible to the naked eye, cyanobacteria are commonly called "blue-green algae". While of a certain toxicity to humans (the prefix "cyano" does not in this case comes from cyanide, but from cyan for their blue-green colors) they are best known for their negative impacts on some ecosystems. Clusters or colonies of bacteria observable to the naked eye does not represent a significant portion of the number of species observed in our flora, but it's still interesting to identify them.